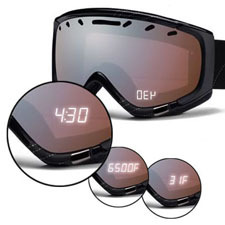 Grand Idea Studio’s Reflective Image Display (RID) technology is a low-cost, simple, and effective method of heads-up display for use on goggles or other protective eyewear. RID creates a visual display utilizing the reflective quality of the eyewear lens, producing an image which appears to float a few inches in front of the wearer’s eyes. Originally designed for outdoor sports, such as skiing, snowboarding, and motocross, the technology can be integrated and customized for any activity that requires the use of eyewear. The RID technology is protected by U.S. Patent #7,249,846, Eyewear with an image projected off of an unassisted eyewear lens to the user. The technology is available for exclusive license from Grand Idea Studio and can be customized to fit your specific needs. For more information, please contact us.